Each of our posts will be different. You should always follow the guidelines given by Mrs. McNally on each assignment. Assignments will be posted on Edmodo or on Mrs. McNally’s blog. A digital footprint is a snapshot of everything you post online. Consider how you look to others viewing your post. Be sure what you’re putting out into the world is the snapshot of yourself you want to put forward. Spelling, grammar, and academic vocabulary help you create a credible footprint. Proofread and double check your work before you publish. Keep your posts free from last names, phone numbers, screen names, and personal email addresses. Although many people will want to read your blog for positive reasons, there are bad people in the world. Stick to your first name and last initial. Your blog is PUBLIC, so stick to information you are comfortable with the world knowing. Anytime you post about your opinion, you are taking a risk in sharing your thoughts and feelings. You will not always agree with what your peers post. You will come across topics you are passionate about. Be sure you are being kind and compassionate in your posts. Although it is always your right to have an opinion, you should refrain from sharing opinions that may make a peer feel marginalized or hurt. When commenting the work of classmates, be positive and constructive. Focus on the good things in their post and help them be the best they can be. Your blog posts are public once you click publish. Check your spelling and grammar before posting. It is helpful to copy and paste your post into a word processor to check for spelling mistakes before posting. You will establish credibility with your audience if your posts are well written and free from mistakes. 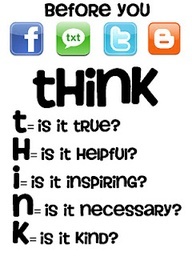 Again, think about the digital footprint you’re portraying. Make sure you put your best foot forward. You should always give credit where credit is due. If you obtained any facts or even just ideas from another post or article, you MUST cite the source. If you do not give credit to the original author, you are plagiarizing. Plagiarizing will always result in falling the assignment. Please cite your sources. Standard citation form for this class is MLA format. You can brush up on your formatting by checking out the link below. You will always have an educational based assignment for blogging. You may be tempted to add your own ideas and posts of your own creation to your blog. That is fine, but please keep the posts educationally centered and class appropriate. You should avoid linking a personal blog to your class blog, as it may inadvertently reveal information you didn’t want to share. May I use your guidelines with my class? Your guidelines for both posts and comments are great (….and the Be More Dog video). I’d appreciate being able to adapt them for my class of students with autism. Is that OK? You can certainly use my guidelines with your students! Good luck! Be more dog! I am using your guidelines for my classroom! Thank you for such a stellar example of what one can do with a blog! Thank you! SO glad you have found something you can use as a resource! Good Luck on your blogging journey! I have read and understand the blogging guide lines. I have read and understand the blogging guidelines. I have read and understand the blogging guidlines.